Indonesia is a developing country where science plays an important role which becomes a major milestone in supporting the resilience and economic development of the Indonesian nation. Various efforts to develop science is done to produce products that are globally competitive, realizing the independence of the nation. But it will all disappear because of the growing corruption. 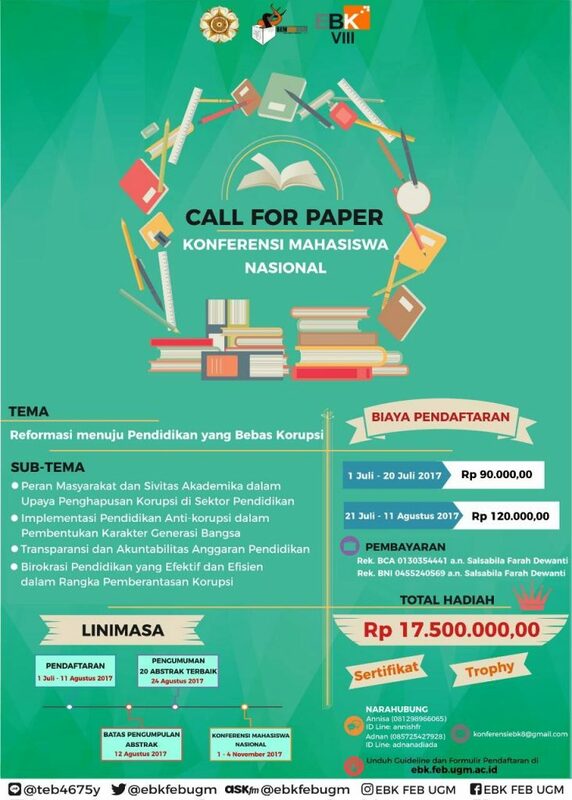 Through the activities of the VIII 2017 National Conference on Corruption-Free Economics conducted by Gadjah Mada University with the title of Paper “KPK Campus Corner: Synergy KPK With Higher Education Institutions in Achieving Education with Free Indonesia Corruption” make efforts to realize the idea, plan and implementation of corruption eradication for the solution of corruption problem development in Indonesia. Scientific Writing Competition aims to explore the potential, creativity and innovation of youth in using, developing or preventing corruption that is difficult to overcome. The objectives of this activity are (1) to channel the students’ talent especially in the activity of eliminating corruption. (2) Troubleshooting Corruption (3) Contributing to the progress of the nation and government. This activity was held on 1st – 4th November 2017 at Gadjah Mada University, Yogyakarta. Participants consist of 10 teams from students scattered throughout Indonesia. This activity is composed of several Groups that annex (1) Best Speaker (2) Best Leader (3) Best delegate. The delegation is Riski Damarfadilah with Management Major from Faculty of Economics and Business Brawijaya University. The National Conference Program of Free Economy Corruption VIII 2017 is divided into three stages, the first stage is with the Abstract Collection, then in the selection until there are 50 teams. After the best 10 teams were invited to the presentation at the VIII 2017 National Conference on Corruption Free Economics at Gadjah Mada University – Yogyakarta. Hope, the delegation will be the winner and make Brawijaya University Specially Faculty of Economics and Business.